This was one of the coffees that we cupped when we stopped at the Boston Stoker (www.bostonstoker.com) coffee shop in Troy Ohio. It is described as having a sweet aroma, full body, balanced acidity and a clean aftertaste. I can tell you we were impressed with the taste when we cupped it and we were looking forward to brewing it at home. It has a good strong aroma from the bag that is somewhat sweet, with hints of chocolate. When it was brewing in the auto-drip Kim could smell the aroma upstairs. The taste is bright with a mild to medium acidity. The flavor seems to go over the front half of the tongue. It seemed to have a touch of citrus, with a medium to full body. Kim thought it paired very good with both chocolate and vanilla. There seems to be a somewhat nutty aroma after grinding the beans. In the French Press the flavors and body were fuller and deeper. The taste of lemon is more pronounced. The coffee is little sweet and a little tart, but very balanced. Kim was eating oatmeal bread toast with peanut butter and cherry jelly and thought they paired well with the taste of the coffee. After brewing with the Chemex coffee maker you get a clean smooth taste with a touch of citrus. There is a lingering tartness, not overly tart but there. It is almost as if the coffee is sweet and sour. I’ll bet it would make a good iced coffee. Here the flavor seems almost to the back of the mouth. All the flavors mixed well and taste very good. Kim thought it tasted good with almonds, figs, dates and apricots. 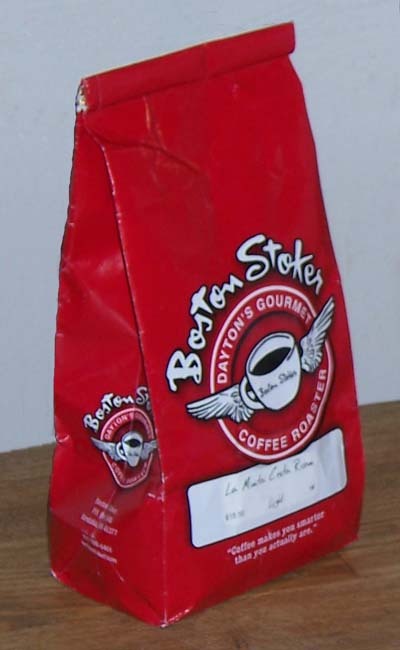 This La Minita from Boston Stoker is a very good tasting cup of coffee. We enjoyed drinking it and sharing it with friends. The reaction from our friends was very good too. If you would like to try a new coffee for the holiday’s we suggest you give this Costa Rican La Minita a try. We think you will like it. We received this coffee for free and offer objective feedback. When you are travelling remember to look for local coffee roasters to visit. You might find an unexpected gem like we did. Until next time remember to stop and enjoy the coffee and conversations.